Peacehaven beach, which is about 6 miles east of Brighton, is Late Cretaceous (83.5-78 million years ago) in age, and comes highly recommended as a fossiliferous location2. When the sediments here were laid down, in the Campanian stage, the region was submerged under a shallow sea, and the UK sat at about 40°N of the equator – the former the product of extreme greenhouse conditions, and the latter of continental drift. 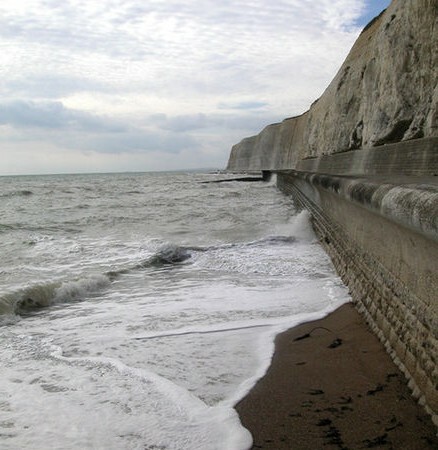 The undercliff at Peacehaven. Photo credit - David Eldridge. While the cliff-base is protected from the elements by a seventies-style coastal defense, the foreshore is home to many different species of echinoid; the giant ammonite, Parapuzosia; the belemnite Gonioteuthis and a type of bivalve, Neithea. We plan to travel in to Brighton in the morning, grab some lunch and then head round the coast to Peacehaven: I’m informed that high tide tomorrow is 1.30pm, so hopefully the foreshore will be satisfactorily exposed by about 3 or 4pm. The beach has SSSI status – so no wanton hammering of the cliffs, sadly – but we should be able to find some interesting specimens to photograph on the beach itself; and I’m told the giant ammonites (which range up to 6 feet in diameter) are well worth seeing alone.